Look at 42.5m trimaran superyacht Adastra by McConaghy Boats and you see the future – not only of yacht design but also of the industry itself. Her performance and development have global aspects: she has a range of 10,000 nautical miles and was designed in Britain for expatriate owners, who live in Hong Kong, to cruise Indonesia and the world. The interior was designed by a Dane who happens to be the first female commodore of the Royal Hong Kong Yacht Club, and the entire vessel was built in China at a yard owned and managed by Australians. Yet Adastra is not extreme for extreme’s sake. Her owner, Anto Marden, spent many years in the shipping business and has sailed all over Southeast Asia in his 13.7 metre trimaran Mazinga, designed by John Shuttleworth. He has extensive knowledge of these boats and the stability of their form, and has known Shuttleworth for some 30 years. About eight years ago, Marden began thinking of a larger yacht with global range. For such a journey he wanted something faster than a sailing boat, and sought an oceangoing powerboat capable of a steady 16 to 18 knots in the open sea and a range of 4,000 nautical miles at 17 knots. Focusing on economical range, it would have to be as light and easily driven as possible. Both aerodynamics and hydrodynamics had to be considered, and the exterior would have to be smooth to reduce friction from water passing over the structure. As Shuttleworth, now assisted by his two sons, Orion and Sky, developed ideas, they became convinced that to meet the brief, the vessel’s skin also would have to form part of the torsional strength – a sort of monocoque approach. In the 1980s, Shuttleworth had come up with the concept of what he calls ‘integrated structure.’ This results in boats that are lighter, stiffer, stronger and less likely to twist than previous multihull designs, an arena in which Shuttleworth excels. Unlike round-the-world speed-record boats with collapsible pipe berths, Adastra would require good load-carrying capacity to provide for luxurious accommodations. Whereas most trimaran outriggers skim the water, her outriggers were expected to be continually immersed as she cut through the waves. Although this increases drag over the skimming type by about eight per cent, it greatly decreases rolling and increases stability. The crossbeam needed to be higher above the water to reduce any impact and noise caused by slamming. To make the structure as light as possible, the vessel would have to be built in composites, as would much of the interior, but this allowed the design of the flowing shapes that define the futuristic appearance. And to achieve very low fuel consumption, every element was scrutinised. If there was a lighter way to achieve the required function, it was sourced or built from scratch. This kind of effort required a builder who would collaborate, and Marden and Shuttleworth turned to Mark Evans, co-owner of the Australian shipyard McConaghy Boats. McConaghy, which has been in business for 45 years, has an outstanding reputation for building performance sailing boats, including renowned maxis such as Wild Oats X and Wild Oats XI, Moneypenny and all three Alfa Romeos. The yard also has turned out Whitbread and Volvo Ocean Race racers and has great expertise in carbon fibre. The yacht’s deck and superstructure are constructed of carbon fibre with a carbon/Nomex honeycomb core, while the hull is an e-glass/Kevlar foam sandwich. Core thickness varies from 20 to 40 millimetres. All the structures were resin infused to ensure high quality and reduce weight. The interior is oak veneer over honeycomb. The most dramatic weight savings, according to Evans, came from changing the makeup of the upper structure from foam/e-glass to carbon/Nomex. ‘It halved the weight of the core and I would guess saved us 200 to 300 kilos,’ he says. The result of all this effort, says Shuttleworth, is that Adastra displaced operates with light ship displacement of 52 tonnes. ‘Throughout the design process, we gave careful consideration to ergonomics and how the boat would be used by the owner and her crew,’ says Orion Shuttleworth. ‘What was particularly challenging was this design was the first of her kind. 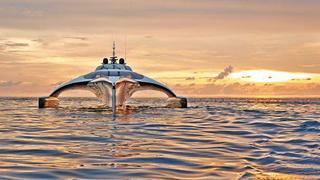 We had to anticipate problems and find practical solutions.’ This creative approach was recognised at the 2013 World Superyacht Awards, where Adastra won the Most Innovative Yacht prize, and at the ShowBoats Design Awards with an award for naval architecture and a judges’ commendation for exterior styling. ‘The fantastically low weight, along with her easily driven exterior, has resulted in one of the, if not the, most fuel-efficient superyachts ever,’ says Shuttleworth. At light load, the yacht burns 4.5 gallons of fuel an hour to cruise at 10.5 knots, which gives a range of 10,000 nautical miles. At 17 knots she uses 98 litres an hour and has a range of 4,000 nautical miles. 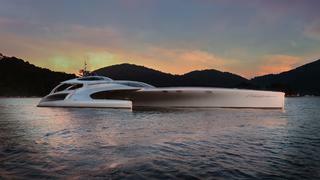 Her top speed, delivered by one 1,150hp Caterpillar C18 engine, is 23.2 knots. ‘Although the owner did not require the vessel to be classed, we chose to use the LY2 Code as a guide for safety and fittings. In cases where this was not practical, we developed creative solutions to provide safe alternatives,’ says Orion Shuttleworth. The large wraparound saloon windows were a structural challenge but they helped the designers lengthen the exterior lines. They also create fantastic views and an atrium effect inside. Integral to the yacht’s development was adding Danish-born Inge Strompf-Jepsen to the team. Operating an architectural design company in Hong Kong, she mixes Scandinavian style with Asian influences. The idea of exposing the curved carbon-fibre beams running through the deckhead of the saloon to save weight was seen as a positive by Strompf-Jepsen, who thinks the exposed structure gives the feeling of being inside the ribcage of a whale. The spacious saloon of Adastra is almost circular in shape and offers superb views to those in the lounging and dining areas. A door through the windscreen allows access to a large foredeck sunbed that can be shaded with an awning suspended from carbon-fibre poles set into the deck. The main helm station, which has two seats on a plinth that give a view over the cabin top, is in a raised pilothouse between the saloon and the aft deck. Hatches in the overhead provide ventilation but also allow the helmsman to put his head out for a 360-degree view when docking. To minimise the helm station’s intrusion on the saloon, it is housed in a wineglass-shaped structure that forms an interesting architectural feature. Behind this is the shaded cockpit, which has an undulating sofa to port and, to starboard, a dining table tucked within the structure of the main hull, the supports for the pilothouse and the rigid bimini top. 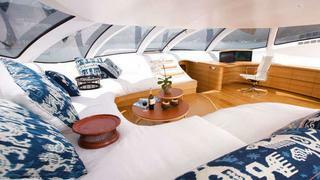 This covered aft deck on Adastra can be enclosed with a set of sliding side covers. 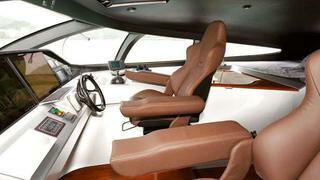 The open deck running aft provides stowage for a 4.8 metre tender that is launched with a removable carbon-fibre davit. A second three metre tender is stowed alongside a freezer in the garage below the aft deck, which has a door that hinges out to create a bathing platform. 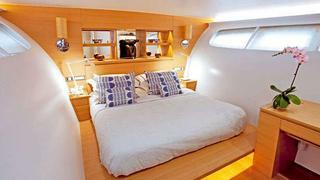 Accommodation on this superyacht is for nine guests and six crew. The master cabin, with access from the deck saloon, is aft in a section of the main hull that flares above the waterline, while the guest cabins are forward of the engine room. Further forward are the crew cabins and galley. Interior materials are limited to light honey oak and semi-gloss white paint with occasional brushed stainless-steel trim. The soft contrast of the surfaces is augmented by white woven fabrics and blue-and-white ikat fabrics collected by Elaine Marden in Indonesia. The sponsons can be reached via steps sculpted into the support wings. They look like louvers on a sports car, and from some angles they almost disappear from view. Removable rails fit into the aft edge of the wings and there are fixed handholds. Liferafts slot into quick-release bins on the back edge of the wings.